1All in Drosera sect. Ptycnostigma unless otherwise noted. 4Closely related to D. cuneifolia. 6Native but not restricted to South Africa. A: Africa is an enormous continent, and contains about 65 carnivorous plant species. Many of these are sundews. Most are occur in southern Africa, but there are a few species that are endemic to tropical Africa. The large island of Madagascar, as troubled as it is by extreme deforestation pressures, adds D. humbertii to the inventory of sundews. 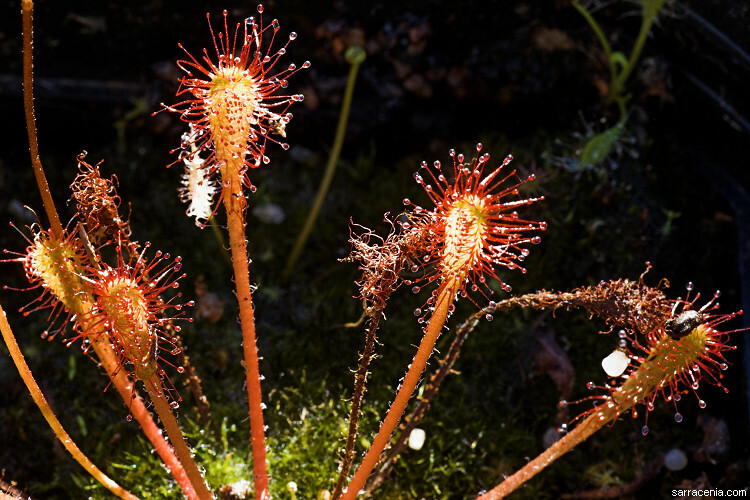 Most of the Drosera of South Africa fall into three main groups. The first group consists of the flat rosetted species such as D. aliciae. These have leaves that are spathulate (spoon shaped) or perhaps wedge-shaped. It is often very difficult to distinguish one species from the next. A second group consists of stem-forming plants such as D. capensis or D. madagascariensis. The third main group includes the tuber-rooted species such as D. cistiflora. As you might expect, there is some controversy regarding these species for example, should some be merged or split. It is sometimes something of a mess. 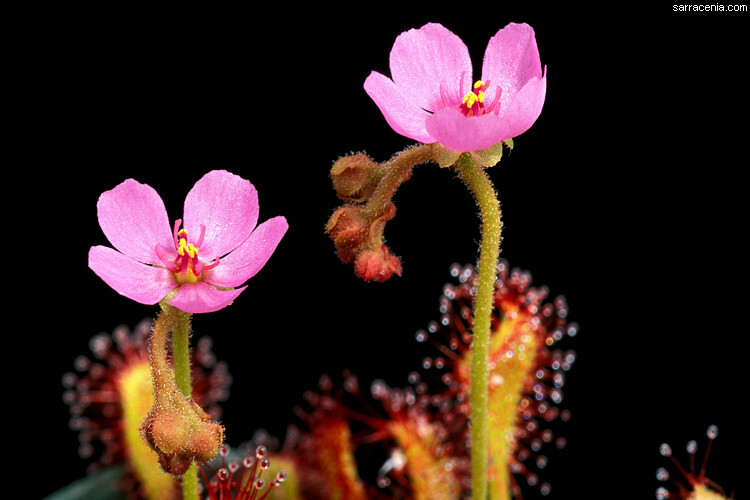 Northwards, the continent has several more Drosera species that live in tropical areas. It appears that much of the African continent has been underbotanized with regards to its carnivorous flora, and it would surprise no one if a comprehensive study revealed more species. Political unrest and instability no doubt contributes to this lack of knowledge about Africa. This species looks much like D. madagascariensis. It produces a basal rosette, which then forms an elongated stem up to 25 cm long. The plant "D. flexicaulis" is probably a synonym. A plant that has a short stem only 3 cm long, and small leaves with petioles 5-8 mm long and leaf blades 4 mm wide and 8 mm long. In the original description, Taton described the plant as having yellow flowers, but this is probably a mistake derived from looking at faded herbarium specimens. The species "D. compacta " is probably the same as D. bequaertii. If you are looking for the now defunct Drosera longiscapa, it went here! Reports of Drosera madagascariensis in South Africa actually are due to misidentifications of this species, as well as of Drosera nidiformis. This scrambling species has an enormously long stem, up to 90 cm long. Leaves are scattered evenly along this stem. Despite the long stem, the leaves are small--the leaf blades are only 3 mm wide and 6 mm long, on petioles 1-1.5 cm long. Sprawling both in habit, and in range, and occurs in much of Africa and Madagascar. The lead species in the "Drosera indica complex." A stemmed, scrambling species that is quite easy to grow. A common species widespread throughout tropical mainland Africa, just absent from southern Africa--i.e., below about 35° S (A. Fleischmann, pers. comm. 2018). Also, of course, found in Madagascar. A long-stemmed species up to 15 cm tall, with petioles 7-20 mm long, and leaf blades 1.5-5 mm wide and 5-15 mm long. The flowers are white with pink veins. Unlike the other stem-forming species of tropical Africa, this is a small, rosetted species with a very hairy surface. A South African endemic, and has enormous, sword-shaped leaves. 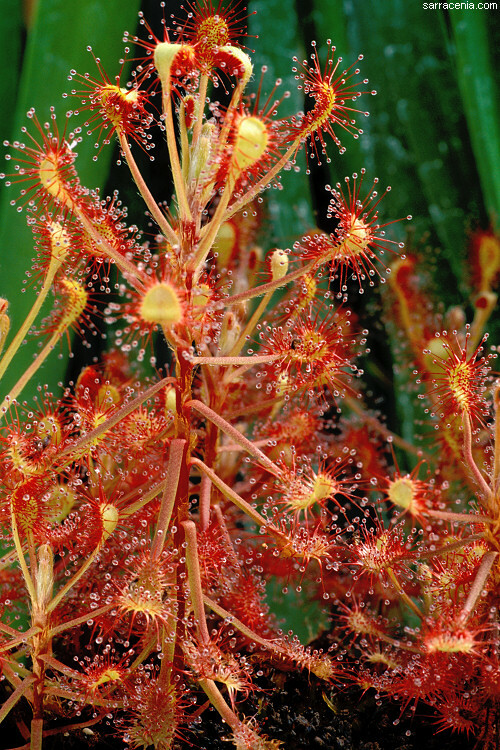 It contends for being the largest sundew, depending upon what you are measuring. 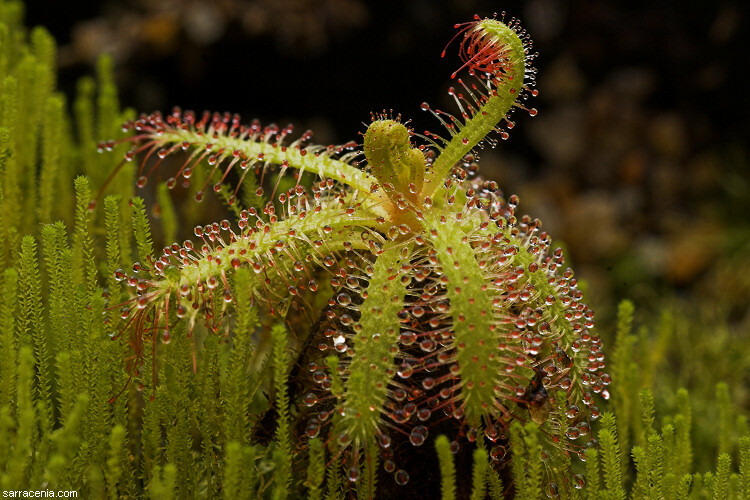 Drosera trinervia--a South African species that has absorbed Drosera afra. This is a naturally occurring hybrid of Drosera aliciae×glabripes. Many of the showiest South Africa Drosera are also the easiest to grow. These easy species respond to standard carnivorous plant cultivation---peat:sand mix, bright light, warm temperatures, plenty of moisture. 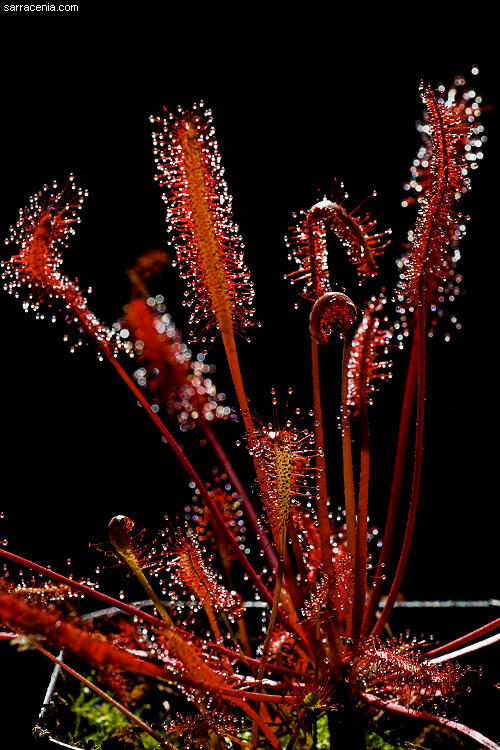 Some are so sturdy, they actually have a fighting chance on the "bright windowsill" that has caused the death of so many other carnivorous plants. D. affinis is easy to grow as a tropical Drosera. Interestingly, plants such as Drosera aliciae, D. capensis, and D. madagascariensis may make a seasoned grower roll his or her eyes in exaggerated boredom, but let's face it---Drosera capensis really is a marvelous species. Just because they are easy to grow and do well in cultivation is no excuse for not appreciating them---it is all the reason to appreciate them even more! Page citations: D'Amato, P. 1998a; Degreef, J.D. 1990; Fleischmann, A. 2018; Fleischmann, A. et al. 2008; Lowrie, A. et al. 2017a, 2017b; Rice, B.A. 2006a; Robinson, A. et al. 2017; Schlauer, J. 1996, 2002; Taton, A. 1945.